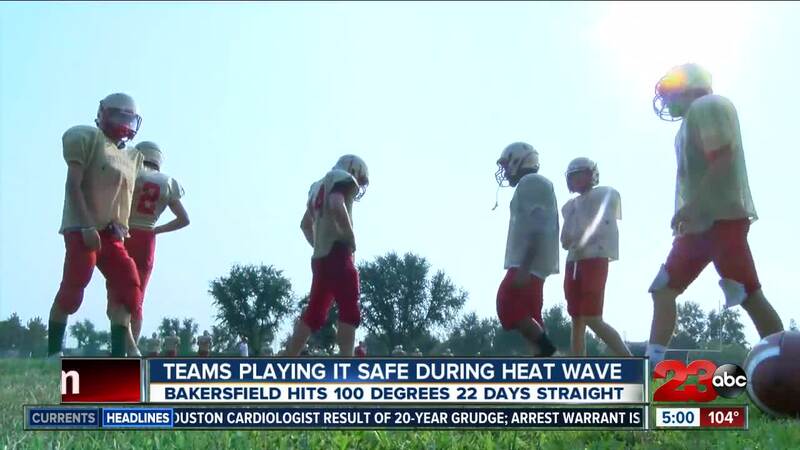 High school football teams are playing it safe as Bakersfield hits triple digits 22 days in a row, with an emphasis on avoiding heat exhaustion. With Bakersfield hitting triple digits for a 22nd day in a row on Wednesday, high school football teams in Kern County are playing it safe. The Kern High School District held a safety symposium on Tuesday night that normally focuses on concussions, but this year, it also included heat exhaustion in the conversation. The high school football season has been moved up a week in Kern County this year, meaning teams will play an additional game in the warm month of August. KHSD also sends out Extreme Heat and Air Quality Index guidelines each morning to athletic directors in the district, essentially giving rules on what they are allowed to do. For example, Wednesday's projected temperature was 107 degrees and the projected AQI was 143; because of that, KHSD did not allow practice to be held outside from 2 p.m. to 6 p.m. If the temperature had been projected to be one degree higher, there would have been no outside practice allowed at all. "We might be hard on them with the football stuff, get after them a bit, but when it comes to their safety, their parents are trusting us to do the right thing with their child," said Centennial High School Head Coach Chad Brown. Staff at Centennial said the days of very limited water breaks are gone, with teams focused on keeping players hydrated and healthy. Multiple water stations were visible at Centennial's practice Wednesday morning. Heat exhaustion and concussions serve as two of the biggest things training staffs keep an eye on. "You gotta realize there's much bigger things than football, than winning football games, and that's these young men's lives," Brown said. Centennial opens the 2018 season at North High School at 7:30 p.m.